What struck me about As I Lay Dying (2007) when it first screened at the Malaysian Shorts Screening in Kuala Lumpur several years ago was its uncharacteristic reliance on close-up shots. This heralded a stylistic break from Malaysian filmmaker Ho Yuhang’s earlier feature films Min (2003) and Sanctuary (2004), which critics claimed were influenced by Taiwanese filmmaker Hou Hsiao-Hsien. Technically, it felt like the filmmaker was branching out in a new direction. In fact I remember conversations with Ho, where he talked about reading dime novels and watching – and gaining respect for – old American film noir. This influence of noir was to crystallise in At the End of Daybreak (2009). But here, in Ho’s transitional phase, perhaps, is a short film, an exercise in the use of close-ups, with a title that references a Faulkner novel. Yet, rather than the use of stream-of-consciousness which Faulkner made famous, we have a child wrestling with adult themes of life and death, an encounter with the monsters that either lie within us, or is hinted at and released only in dreams. 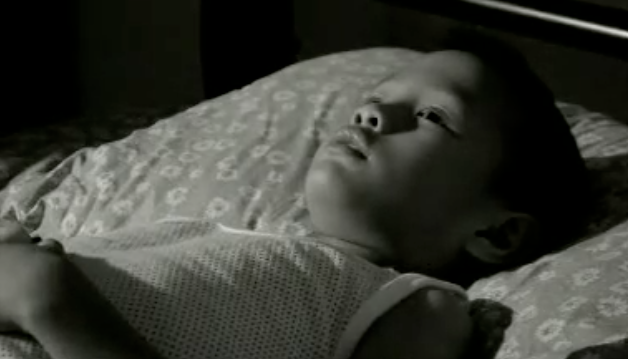 Child actor Wong Zi Jiang makes an apt subject for such close-ups, having proven his mettle in fellow filmmaker Liew Seng Tat’s Flower in the Pocket (2007). Shot in black and white (except for the final scene which is in colour), this film sensitively explores a child’s fear of death, caught on film half in shadow, between light and darkness, breath and sleep, dream and wakefulness. Yet, there are fears that cannot be soothed even by a loving mother. And nature becomes something of a threat. My first impressions again: the opening shot of rain falling and water pooling on the ground, the view of a small schoolboy’s legs entering home wet, and then taking precautionary steps to prevent catching cold from the rain; a woman’s legs entering the porch with an umbrella, slipping off her sandals and drawing the grill door shut behind her. These are familiar gestures to tropical Asian homes, and make up points of memory in my childhood. But perhaps more resonant is the sense of being eight again, lying in bed at night unable to sleep, looking up at the revolving ceiling fan and agonising over what death feels like: being alone in a dark, endless void? The film sensually captures the pace of lethargy and fatigue as the boy gradually slips into sleep and the ceiling fan just as slowly comes to a perfect stop. One last account from the past: Ho, in discussing his first feature Min with me, mentioned the famous Chinese philosopher Zhuangzi. Upon waking from a dream, Zhuangzi was not entirely convinced that he was a man who dreamt he was a butterfly. Indeed he could be a butterfly dreaming that he was a man. This might be our dilemma in understanding why the closing scene of the film is in colour. Which is dream and which is reality? The black and white sequences or the colour finale? See Ho Yuhang’s As I Lay Dying. As I Lay Dying. By Yuhang Ho. Dir. Yuhang Ho. Perf. Zi Jiang Wong and Justina Tay. Paperheart Sdn. Bhd., 2007. At the End of Daybreak. By Yuhang Ho. Dir. Yuhang Ho. Perf. Tien You Chui, Ying Hung Wai and Meng Hui Ng. Prod. Lorna Tee. Paperheart Sdn. Bhd., 2009. Flower in the Pocket. By Seng Tat Liew. Dir. Seng Tat Liew. Perf. Ming Wei Lim, Zi Jiang Wong and James Lee. Prod. Yen San Michelle Lo. Da Huang Pictures Sdn. Bhd., 2007. Min. By Yuhang Ho. Dir. Yuhang Ho. Perf. Yasmin Ahmad, Ahmad Hashim and Alvin Wong. Prod. Tiara Jacquelina. 2003. Sanctuary. By Yuhang Ho. Dir. Yuhang Ho. Perf. Boh Lai Loh, Thian See Chua and Leong Fatt Chin. Prod. James Lee. Doghouse 73 Pictures, 2004. Khoo Gaik Cheng is a lecturer at the Australian National University where she teaches gender, cultural studies and Southeast Asian cinema. She is the author of Reclaiming Adat: Contemporary Malaysian Film and Literature (UBC Press, 2005).